Bedwetting, whether experienced by a child or an adult, can be stressful for them as well as their caregivers. 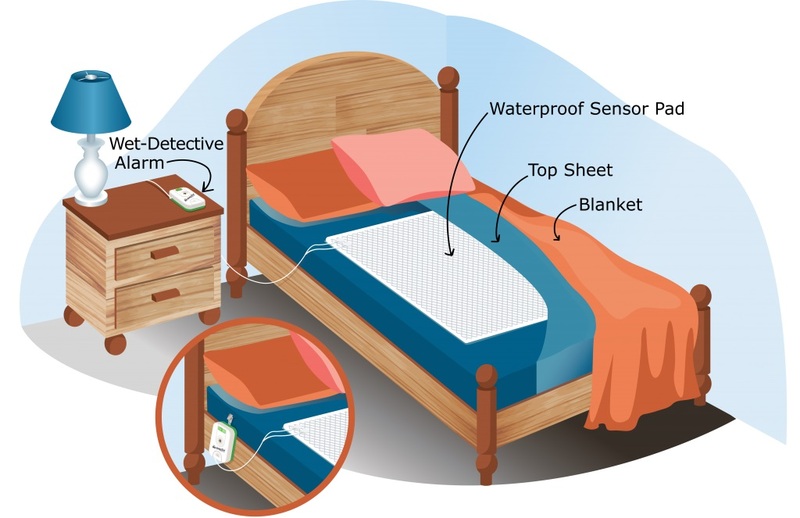 The Wet Detective can alleviate some of the stress by offering a simple and effective solution meant to correct bedwetting in children and alert caregivers that bedwetting has occurred, also making it ideal for adults with incontinence issues. The Wet Detective waterproof pad is placed under the person with the bedwetting problem. An extra-loud alarm sounds when the pad is exposed to urine. This alerts the parent or caregiver that an accident has occurred so that the pad can be changed. Over time, this helps the child learn to awaken to urge to urinate in anticipation of the alarm. Parents should expect to see extended periods of dryness within 1 to 3 months of using the Wet Detective. Insert 2 AA batteries (not included) into the battery compartment. The respond button will flash when inserted correctly. Rechargeable batteries are not recommended. Choose alarm setting by sliding the switch. Choose from light only, alert beep, medium alarm, or loud alarm. Attach cable to the jack located at the side of the alarm unit and attach the snaps at the other end of the cable to the snaps on the pad. Place the pad on the bed and rest the alarm unit on the bedside table or clip it to the bed skirt or other nearby location using the clip on the back. Avoid putting the alarm unit where the cable can wrap around the user or cause a fall. To shut off alarm, press the respond button that will cause the alarm to “snooze.” The light only, alert beep, and medium alarm settings have a respond snooze time of 15 minutes. The loud alarm has a respond snooze time of 1 minute. Unsnap the cable from the pad and replace with a clean, dry sensor pad to stop the alarm from going off again after the respond time. Pad should be clean and dry before reusing. Simply machine wash in warm water and tumble dry medium. No not iron, bleach, or dry clean. The Wet Detective is ideal for adults with an incontinence problem and their families, or caregivers. It also works well for those who are completely unaware when they have an accident or those unable to communicate with their caregivers when incontinence care is needed. The Wet Detective also offers greater flexibility in the management of incontinence because the waterproof pad can also be used in chairs and wheelchairs, as well as beds. Thank you for the fantastic service. Definitely went over and above. Would highly recommend your company.